Fujitsu factory in Mie The famous Japanese electronics giants Sony and Panasonic are among the most famous companies in the world. Other Japanese electronic appliance makers include Hitachi, NEC, Fujitsu, Toshiba, Kyocera, Sharp, Sanyo, TDK, and Pioneer. Many Japanese electronic companies have moved production overseas to take advantage of cheap labor. Sony and Panasonic have had plants in Mexico since the 1980s that produce goods for the United States market. These days many companies have factories, suppliers or partners in China. Among the electronics and high-tech companies in Japan are Seiko Epson, a major, inkjet printer maker; and Asahi Glass, the world’s second largest maker of glass for liquid crystal displays. TDK, the world’s biggest maker of magnetic heads for disk drives, was known as Tokyo Denkai Kagaku Kogyo until 1983. Stereo equipment-maker Onkyo is based in Osaka. Kenwood focuses on car stereos. In December 2010, JVC Kenwood planned to get a hold of enough capital so that it could leave Panasonic group’s umbrella as Panasonic stake in the company would be reduced from 28 percent to 20 percent. LIM Corp supplies 60 percent of Japan’s font engines---computer software used to display characters and letters on screens. The technology is essential of displaying charcters and letters on cell phone screens. LIM is now trying to push it software in Silicon Valley. It offers displays in Russian, Hindi, Thai and other alphabets. Kyocera is major maker of cell phones and electronics. It began in 1950 as the Kyoto Ceramics Co. with $30,00 polled from relatives of the founder, Kazuo Inamori In the mid 2000s it had ¥1.2 trillion in sales and 60,00 employees. It recent years it has fallen pm harder times and 20 percent of its workforce. For a while Kyocera was Japan's no. 2 telephone company and a major computer chips manufacturer. In spite of failing to get into one of Japan's prestigious universities, Inamori managed to secure a chemical engineering degree and get at a job for a company that made insulators. Angered by the company’s lack of enthusiasm about his passion for ceramics, he quit in 1959 at he age of 27 and formed a new company with seven coworkers called Kyocera Co. with money from a $10,000 loan. By 1997, Kyocera Co. was a $6 billion company that dominated the world market for ceramic casings for computer chips. In 1997 Inamori suddenly decided to retire in 1997 and become a monk. Famous for combining religion teachings with business techniques, Inamori reportedly was inspired by a book about religion that given to him when he was bedridden with tuberculosis at the age of 13 and thought he was going to die. When Kyocera became successful, Inamori became an inspirational speaker, lecturing and writing about topics such as "For People and for Profit" and "A Passion for Success." Kyocera employees revered him as if he were a religious figure, attending daily philosophy meetings at 7:00am before work began. One employee told the New York Times, "I felt electricity when he was near." Kazuo Inamori, founder and honorary president of Kyocera Corp, was named chairman of JAL. He introduced an “amoeba-style” of management that aims to give each employee a sense of responsibility by dividing the company into small groups, each of which has an independent accounting system.The airline continued operating as normal after the bankruptcy. Under the rehabilitation plan it is hoped JAL will turn itself around and earn a $900 million profit in 2012. Kyocera’s Kazuo Ianamori was listed by Forbes as the 28th richest man in Japan in 2009. A philosopher and writer, he is regarded as an innovator and skilled strategist, a kind of Japanese cross between GE’s Jack Welch and Apple’s Steven Job. In addition to that he is an ordained Buddhist priest. In 2009 he was appointed the CEO of Japan Airlines after it filed for bankruptcy--- a thankless, some say, impossible job. Ricoh is Japan’s second largest office equipment maker after Canon. Competition by Canon and Ricoh have dramatically reduced Xerox’s share outside the United States. Ricoh makes copiers, office equipment and digital cameras. Based in Tokyo, the company currently has about 110,000 employees around the world. Ricoh reported sales for fiscal year 2010-2011 of 1.94 trillion yen, or $23.9 billion. That was about 3.9 percent below the forecast the company. The company was badly affected by the earthquake and tsunami in 2011. Operating profits were 60.2 billion yen, or $740 million, 29.2 percent below the forecast. The company attributed part of the shortfall to the earthquake. Mitsubishi Electronics was back in the black in 2010. It made a group net profit of $1.4 billion in fiscal 2010-2011, a 4.4-fold jump from the previous year, on the back of strong sales of home appliances and a strong performance in its industry automation system business. Total revenues for fiscal 2010-2011 were about $40 billion, up 8.7 percent from the previous year. Mitsubishi is spending $200 million to build a power transformer plant in the United States, where replacement demand for power grid facilities is strong. The plant is being built near Memphis Tennessee and is expected to be operational in April 2013. Mitsubishi has invested in Areva, a major French nuclear energy company, to boost its clout in the global nuclear market. Mitsubishi is developing a compressed air solar power plant. It uses mirrors to direct sunlight to a heat-receiving unit using the heat to compress air which powers a turbine and generator. Existing methods used steam to operate the turbines. The Mitsubishi method is simpler and requires no water and is 20 to 30 percent cheaper. Mitsubishi Electronics makes cell phones, flat-screen television and other electronic devises. It and Hitachi are currently trying to make elevators that can break the record---reaching speeds of 1,300 meters per minute---and are looking for buyers in the Middle East. The Mitsubishi Laservue is the first high definition television powered by lasers, which means more vibrant colors. The 65-inch model sells for $6,999 and uses two thirds less power than a same size LCD or plasma screen television. In December 2006, Mitsubishi recalled about 1.3 million cell phone batteries because of dangers they might overheat and explode. In March 2008 it said that it would stop making cell phones due to lack of profits in the Japanese market. 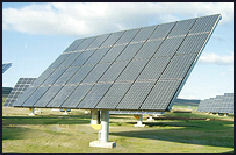 In March 2008, Mitsubishi said it would invest $70 million to increase production of solar cells. Sanyo solar panels Sanyo was Japan’s third largest electronic maker before falling on hard times and recently being swallowed up by Panasonic. Based in Osaka, it produces digital cameras, DVD players, and household appliances and is establishing itself as a leader in rechargeable batteries and solar cells and imaginative, environmentally-friendly products such as batteries that recharge with a solar panels and a washing machine that recycles water. The company employed 96,000 people in July 2005 before job cuts. Sanyo got its start making bicycle lamps. Its first factory was opened in Hyogo prefecture in 1947 and for along time was known for its refrigerators and batteries. When it entered the consumer electronics business it was consider a maker of cheap stuff a notch below the products made by Sony and Panasonic. Toshio Iue, the founder of Sanyo, was the brother-in-law, of Konosuke Matsushita, the founder of Panasonic Corporation. In 1917, the two men started Panasonic with $50 in savings and $50 in loans in the larger of two rooms in a rented house. Their first product was a two-way light socket that was a big seller. Sanyo was headed by a woman Tomoyo Nonaka for a couple of tough years. A former newscaster, she became an outside director in 2002 and was named chairwoman of the company in 2005, at a time when Sanyo was having a number of difficulties, and was forced to step down after an accounting scandal in March 2007. Nonaka reorganized Sanyo’s 300 subsidiaries to three division---environment, energy and lifestyle---and aimed to make Sanyo into a leader of producing environmentally-friendly products. Under her leadership Sanyo’s debts continue to mount. Some analysts said her ideas were good by her timing was off. Sanyo has struggled against competition from China, South Korea and Taiwan that have lower production cost, and have pushed down prices and profit margins on products like digital cameras and flat-screen televisions. The nail in the coffin was the Niigata earthquake in 2004. 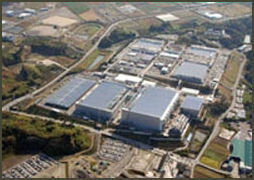 A large Sanyo chip-making plant was shut down by the earthquake in Niigata 2004. Sanyo had originally planned to post record profits but the earthquake caused it to post loses for the year. Sanyo has been accused of it fudging its financial reports Over a six year period ending in 2006 Sanyo inflated its earnings by around $5 billion so the company didn;t look so bad on paper. Sanyo was investigated by the Securities and Exchange Surveillance Commission. Sanyo launched a major restructuring program in 2005. It laid off 14,000 workers, 15 percent of its work force, closed factories, and streamlined unprofitable area like home appliances and semiconductors, and DVD players. It invested in solar panels, rechargeable batteries and other environmental-related businesses and issued new shares to help finance the program. Sanyo posted a profit of ¥15.8 billion for the April-September 2007 period. It the company’s first profit in three years, thanks to cost cutting efforts and robust sales of batteries and digital cameras. The same period in 2006 it posted a ¥3.62 billion loss. As of 2007, Daiwa and Goldman Sachs owned 66 percent of Sanyo in terms of voting rights. In March 2006 they provided ¥250 billion in financial support in exchange for Sanyo’s preferred shares. Sumitomo Mitsui also has a large stake in Sanyo. Sanyo lost money in 2009 after originally projecting to break even because of loses due to a washer-dryer recall and early retirement program. In September 2009, Sanyo recalled 160,000 top-loading dryers because of a fire risk. In the mid 2000s, Panasonic acquired 70.5 percent stake of Sanyo by paying ¥131 a share to three major stockholders--- Goldman Sachs, Daiwa Securities and Sumitomo Mitsui Financial Group . It was the largest acquisition in Japan’s consumer electronic industry. Panasonic plans to make Sanyo a subsidiary. The merger---predicted in a salaryman manga a year before---cemented Panasonic’s position as Japan’s largest and the world’s second largest electronics firm, with combined sales of $110 billion. But, effectively, Panasonic is the largest. General Electric is the world’s largest electronic firm with revenues of about $170 billion but nearly 50 percent of its revenues come from financial service activities and iit was hurt more seriously during the global financial crisis in 2008 and 2009 than Panasonic. The deal made Panasonic the world’s biggest maker of rechargeable batteries. There is a big market for lithium-ion batteries in electronics such as cell phones, computers and digital cameras and increasingly in hybrid and electronic cars. 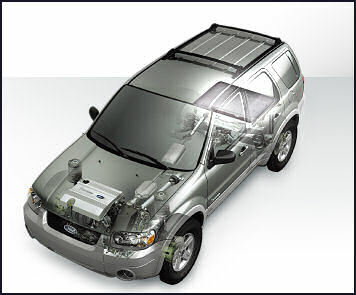 The market for these batteries is expect to increase 150 percent between 2005 and 2012 to $7.5 billion in sales. Sanyo electric car batteries Sanyo is the world’s largest lithium ion battery supplier, the world’s largest maker of rechargeable batteries and major maker of solar cells. For a while it was the world’s largest maker digital cameras but has since reduced it presence on that business. These days Sanyo focuses on batteries, solar energy and electronic devices. in July 2008, Sanyo announced it was going to build a new factory to make rechargeable lithium ion batteries near Kobe in the Hyogo Prefecture. Panasonic, Sony and Sanyo are also major producers of rechargeable batteries. Sanyo has opened a lab to develop next generation, low-cost solar cells made with a very thin film of silicon. Sanyo hopes to lower the cost of generating one watt of electricity with solar power from ¥250 to ¥150 by 2012 by applying its semiconductor expertise to solar technology. Sanyo is also a leader in making solar modules for automobiles.Panasonic plans to invest over $1 billion in its solar business over six years between 2010 and 2016. The company hopes its merger with Sanyo will help it become one of Japan’s top three solar panel producers. Casio sells products in 120 countries and made a name for itself with calculators. Its first calculator, the “001," was introduced in September 1965. It weighed 17 kilograms and sold for ¥380,000. In 1972 it released a palm-size calculator called the Casio Mini that sold for ¥12,800. In 1982 it released a credit-card -size calculator about 0.8 millimeters thick. In January 2006, Casio sold its 1 billionth calculator. Casio now gets most of its money from digital cameras and electronic dictionaries. It also makes liquid crystal displays and other components and supplies Softbank and KDDI with cell phone handsets. Casio has had great success with it G-Shock watches. Pioneer company has formed a tie-up with Sharp with Sharp taking a 15 percent stake in Pioneer and supplying it with liquid crystal display screens in return for Sharp taking advantage of Pioneer’s audio technology. Pioneer lost a record $1.3 billion in fiscal 2008-2009. In February 2009, it announced it was going to cut 10,000 workers and exit the flat-screen television market. JVC makes Victor products in Japan and JVC products abroad. It used to be RCA Victor and was owned by Panasonic. Until recently its president came from Panasonic. In 2007 Panasonic lowered its stake in the company from 52 percent to 37 percent and Kenwood was brought in as partner to improve JVC’s consumer products division. JVC was founded in 1927. It produced Japan’s first television receiver in 1939 and the country’s first stereo LP in 1958. It joined the Panasonic group in 1954 and won international recognition in the 1970s and 80 for developing the VHS video format and winning the battle against Sony’s Betamax. It has been losing money in recent years due to lack of inspiring products. In April 2008, JVC announced it was puling out of the Japanese market and concentrating on U.S. and European markets. advanced Sony digital camera Nikon, Canon, Konica-Minolta, Fuji Film, Rohm, Ricoh, Olympus are well-know Japanese camera makers. Canon, Sony, Ricoh and Olympus have been leaders in digital cameras. Ricoh does half its business overseas. It has posted profits for nine years in a row. Pentax makes cameras, digital cameras and medical equipment. Based in Tokyo, it posted large losses it the mid 2000s due the decline of its photographic unit as a result of competition from digital cameras. It is now trying to expand its medical equipment and optical components businesses which sells endoscopes and lenses for cell phone cameras. Until 2002 Pentax was called Asahi Kogaku Kogyu. In December 2006, Japan’s leading optical glassmaker Hoya Corp acquired Pentax for $765 to gain access to its medical-related operations, Hoya, a high-tech glassmaker, turned Pentax into a subsidiary in early 2007 and absorbed the company in March 2008. Hoya and Pentax introduced Japan’s first single reflex lens camera in 1952. In November 2009, JVC Kenwood announced that it would acquire Pentax. Hoya Corp. opened a plant to make optical glass for digital camera lenses and other products in Shandong Province, China. The firm has been pressing ahead with diversification of its production bases since its plant in Akishima, Tokyo, was forced to stop operations due to the rolling power blackouts. Tokyo-based Nikon produces film and digital cameras and scanners and other products. It produced its first film camera in 1948. The quality and durability of its cameras have made them popular with amateurs and professionals for decades. The first Nikon cameras arrived in the United States in the 1950s when American servicemen stationed in Japan began bringing them home. Nikon is the world’s second largest maker of single-reflex lens (SLR) cameras and a major supplier of chip-making equipment. Nikons posted healthy profits in 2004 based on sales of digital cameras and semiconductor-manufacturing equipment and chalked up record sales of ¥955.79 billion and record net profit of ¥75.48 billion in fiscal 2007 and ¥2.8 billion in fiscal 2008-2009 in the middle of the global financial crisis. Nikon had 23,759 employees in 2009 according to its website. In January 2006, Nikon announced that it would stop making most of its film cameras and concentrate on digital cameras. In 2005, digital cameras made up 75 percent of Nikon’s total sales of $1.5 billion up from 47 percent in 2002. Nikon now makes SLR cameras with a high definition video camera that can use still camera lenses. Nikon was projected to lose a record $280 million in fiscal 2009. In January 2003, the two camera-makers Konica and Minolta merged to form Konica-Minolta. Konica was the world’s third largest photo film maker. Minolta was a leader in single lens reflex cameras. Together, they poured their energy into making office machines and printers. The new company Konica Minolta Holdings had combined sales $9.18 billion a year and 39,000 employees. Konica-Minolta produced film camera for more than 100 years. 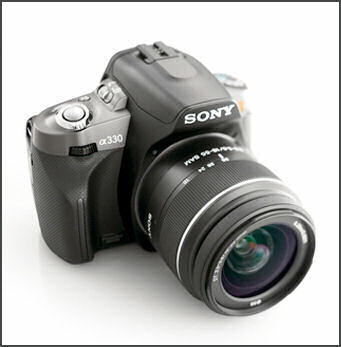 In 2006 it produced its last film and stop making digital cameras too and sold it single reflex lens division to Sony and concentrated on making office equipment and profitable advanced electronics. Konica Minolta is the world’s second largest maker of film used in liquid crystal displays. It lost money in 2005 and made a ¥1.7 billion profit in fiscal 2008-2009 that was significantly lower than the previous year. Fujifilm has diversified from making film into manufacturing industrial materials and equipment ranging from liquid-crystal-display film to medical X-ray systems. It has managed to make profits by expansion into digital cameras and other imaging processes and has done supplying equipment to make prints at photo shops which do good business making digital camera prints. Fujifilm is the world’s largest maker of liquid crystal display film. It has revamped its digital camera business, which relies manly on Chinese factories for production, and expanded into the drug business by purchasing the mid-size drug maker Toyama Chemical. In 2008 it announced the construction of $65 million plant in Shizuoka Prefecture to make liquid crystal display film. It will begin production in April 2009. The Fuji FinePix is a 10-megapixel slim camera that can detect and focus on up to 10 faces in a single frame and automatically adapt to different lighting. It cost $300. As part of its efforts to diversify Fujifilm has entered the cosmetics market, with particularly attention focused on producing skin care products for China. Fujifim has also bought subsidiaries of the pharmaceutical giant Merck as part of its strategy to break into the biopharmaceutical sector. Tokyo-based Seiko is (or was) the world's largest manufacturer of watches. It also makes camera and has sales of around $2 billion a year. The main factory of the Seiko covers 4.5 acres, has 1,150 robots and produces a new watch every two seconds. According to the Guinness Book of Records in the 1990s, the world's smallest television was Seiko TV-Wrist Watch. It had a 1.2 inch screen and weighs 2.8 ounces. Apple captured 72 percent of the Japan smartphone market in fiscal 2009, with shipments of 1.69 million iPhones. Long line of people have waited outside electronics store to get their hands on iPods, iPhones and iPads. Publishers, bookstores and game makers have profited from software and applications for iPhones and iPads.